Early one morning, in the middle of a snowstorm, I set out from my new home in Nazlini, Arizona to attend a Christmas party in Flagstaff. Being cut from the car and life-flighted to the Flagstaff Medical Center was not a part of the plan. Fortunately, there were people who stopped to help me. Nevertheless, I realized that had my accident occurred at a time of day when the roads were less traveled, I may have lain there, undiscovered, for a long time. While I was grateful that I had incurred relatively minor injuries, I remained struck by how unprepared I was. There were so many things I should have had in that car. Also, the things I did have were too far away to be useful to me. Instead, I had been totally dependent on the kindness of strangers. 1.) 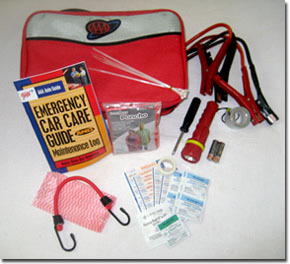 Buy a car safety kit and store it, along with a basic first aid kit, in the back seat. Safety equipment stored in the trunk is not of much help if you’re trapped inside your vehicle. 2.) Put two blankets in the back seat. In the high desert of Arizona, the days are sunny, and the temperature can get into the sixties. Nights, however, can get down into the twenties. It can be great sleeping weather if you’re snuggled in bed, but it’s another matter if you’re stranded on the side of a rural road. 3.) Place a small box of shelf-stable foods on the floorboard of the back seat. A box of granola bars and some trail mix may prove useful when outside food isn’t nearby. A gallon of water would be equally helpful. 4.) Keep at least two quarts of motor oil and a bag of kitty litter in the trunk. An oil leak can spring up anytime, anyplace. Having a quart of oil can keep you from being stranded on the road with a blown engine. Kitty litter is excellent for scattering under tires to gain traction on ice. 5.) Learn how to change a tire. My dad tried several times to teach me how to change a tire. It never took. As soon as I got out of the hospital, I had the local auto repairman show me. This time, I paid attention. Now I’m prepared in the event that I get a flat outside the range of a cell phone tower. While this isn’t a comprehensive list of safety precautions to take when preparing for a road trip, it will get you started in evaluating your particular destination and vehicle and making any needed adjustments.